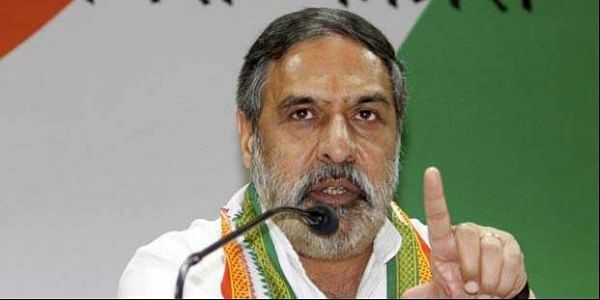 Congress senior spokesperson Anand Sharma also accused the prime minister of dragging the political discourse to an "unacceptable low" by making statements that harmed the dignity of his post. NEW DELHI: The Congress today demanded that Prime Minister Narendra Modi apologise to former prime minister Manmohan Singh and former vice president Hamid Ansari and withdraw his statement alleging that "they were colluding with Pakistan" for defeating the BJP in Gujarat polls. He alleged that the Modi was "frustrated" as he had sensed a clear defeat of the BJP in Gujarat and was resorting to use of foul language in his bid to whip up emotions and polarise Gujarat. "The prime minister should restore the dignity of the political discourse, withdraw what he has said and apologise to the former prime minister and the former vice president," Sharma told reporters. Addressing an election rally, Modi yesterday claimed that Congress leaders held a secret meeting with current and former Pakistani officials a day ahead of Mani Shankar Aiyar's "neech" jibe against him and that there was an attempt by Pakistan to interfere in the Gujarat polls. Sharma dismissed as "absurd" the prime minister's statement and said while Modi "belongs to a party which has no contribution in the country's freedom struggle while the Congress has fought it". It is expected of the prime minister of India to be dignified in his discourse, he said, adding the prime minister should always remember that the Congress does not level allegations and cast aspersions on those who are on high positions. "He is seeking sympathy desperately by playing the victim card, which he and his party are playing while dragging the political discourse to an unacceptable low," he said. His statement yesterday by insinuation, accusing the former vice president of India and former prime minister Manmohan Singh of doing something which was improper, "is highly irresponsible, unwarranted and condemnable", Sharma said. The Congress leader said the prime minister must remember that mere attending a social function in which high dignitaries were present should not be given a "sinister and sensational twist", especially when it was not a secret meeting. He said the former chief of Indian Army, former Indian High Commissioners to Pakistan and eminent journalists were all present at this dinner meeting hosted by Aiyar. "Since when has it become a crime and one needs to seek permission before attending a dinner," he asked. The Congress leader also asked why the prime minister does not talk about progress and the country's economy. "Why doesn't he talk about farmers today? Why doesn't he talk about employment, the future of youth? What is their agenda, on what basis are they fighting the polls?" he asked.